The term hemothorax can be defined as the entry of pleural fluid and blood into the pleural cavity. It needs to be pleural fluid with a hematocrit of 25% - 50% of the patient’s blood to be diagnosed as a hemothorax. There are two layers of pleura. One of which covers the lung surface (visceral pleura) and the other the inside of the chest wall (parietal pleura). (For more detailed information on lung anatomy).These layers of pleura adhere to each other to keep the lung from collapsing, even with the expiration of air from the lung. If air or fluid enters the pleural cavity in between these layers of pleura, it causes the lung to collapse due to its elastic recoil. 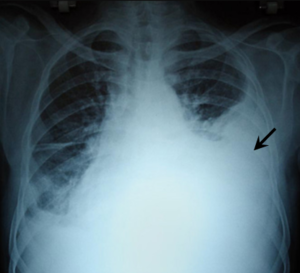 If it is only air entering the pleural cavity it causes a pneumothorax. If it is fluid or blood entering the pleural cavity it could cause a pleural effusion or hemothorax. Initial management in most cases is through chest tube drainage where a large tube as an adequate initial approach unless an aortic dissection or rupture is suspected. (For more information on chest drains). After the tube thoracostomy has been performed, a CXR should be repeated in order to identify the position of the chest tube, to reveal other intrathoracic pathology and to confirm whether the collection of blood within the pleural cavity has been fully drained. Occasionally a surgical exploration may be used. This may be indicated if there is blood loss via the chest drain over 1,500 ml in 24 h or 200 ml per hour during several successive hours and the need for repeated blood transfusions to maintain haemodynamic stability. Patients who present with active blood loss but stable haemodynamics may be treated with Video-Assisted Thoracoscopic Surgery (VATS). This may be used to stop the bleeding and also in the evacuation of blood clots and breakdown of adhesions. A thoracotomy is the procedure of choice for surgical exploration of the chest when a massive haemothorax or persistent bleeding is present. There are no published data regarding the physiotherapy management of patients with pneumothorax or hemothorax. The patient's clinical picture should lead the physiotherapist in deciding what treatment is suitable. If the patient has a chest tube and intercostal drain in, the treatment might be different from when the patient had surgery. Help to improve ventilation, oxygenation and to re-inflate atelactic lung areas. This could be done by deep breathing exercise techniques. Help to improve the patient's exercise tolerance and mobility. This could be done by assisting with mobilisation or general strengthening exercises. Help to maintain airway clearance. This could be done by showing the patient assisted coughing techniques to help clear any secretions. Through imaging, the diagnosis of a pneumothorax needs to be cancelled out. The hematocrit of the fluid from the pleural cavity could also be tested to see if it could be diagnosed as a pleural effusion or a hemothorax. ↑ 1.0 1.1 Patrini D, Panagiotopoulos N, Pararajasingham J, Gvinianidze L, Iqbal Y, Lawrence DR. Etiology and management of spontaneous haemothorax. Journal of thoracic disease. 2015 Mar;7(3):520. ↑ 2.0 2.1 2.2 Boersma WG, Stigt JA, Smit HJ. Treatment of haemothorax. Respiratory medicine. 2010 Nov 1;104(11):1583-7. ↑ 3.0 3.1 Yeam I, Sassoon C. Haemothorax and chylothorax. Curr Opin Pulm Med 1997;3:310e4. ↑ 4.0 4.1 Baumann MH, Strange C, Heffner JE, Light R, Kirby TJ, Klein J, Luketich JD, Panacek EA, Sahn SA. AACP Pneumothorax Consensus Group. Management of spontaneous pneumothorax: an American College of Chest Physicians Delphi consensus statement. Chest 2001 Feb;119(2):590e602. ↑ Ali HA, Lippmann M, Mundathaje U, Khaleeq G. Spontaneous hemothorax: a comprehensive review. Chest 2008;134:1056e65. ↑ Liu D-W, Liu H-P, Lin PJ, et al. Video-assisted thoracic surgery in treatment of chest trauma. J Trauma 1997;42:670e4. ↑ Lowdermilk GA, Naunheim KS. Thoracoscopic evaluation and treatment of thoracic trauma. Surg Clin North Am 2000;80: 1535e42.